I’m a fairly recent convert to the world of smart phones. I acquired an Android this past year and for the most part, have managed to use only a very small fraction of it’s capabilities. I’m getting better, but I find that taking the time to learn HOW to do this or that is somewhat overwhelming. 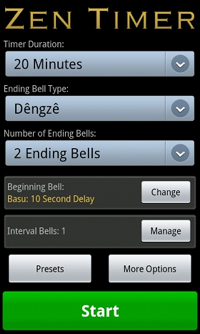 BUT, I have found an app that is actually a very handy tool for a practicing Yogini — The Zen Timer! I love this App!! It’s the ONLY app I’ve paid for (ok, I haven’t downloaded very many, but the ones I have were all free), but it’s worth every penny of the $2.99 I spent. 🙂 I almost always have my phone on me, so I now have a meditation timer handy whenever I want it. I can go to my car at lunch to meditate and never worry about taking too much time. I just set the timer and my choice of a lovely bell will tell me when it’s time to go back into the office. Rushing around in the a.m. and I don’t have much time to meditate? I now have no real excuse … I can set the timer for ten minutes and ten minutes is better than the no minutes I’d often get. So, if you have an Android, definitely download this app. If you have a different smart phone, find out if you have access to a similar application … and begin to take your meditation practice with you, wherever you go. Has anyone else used this app? How do you all meditate when you are boundaried by scheduling? I’d love to hear your ideas!